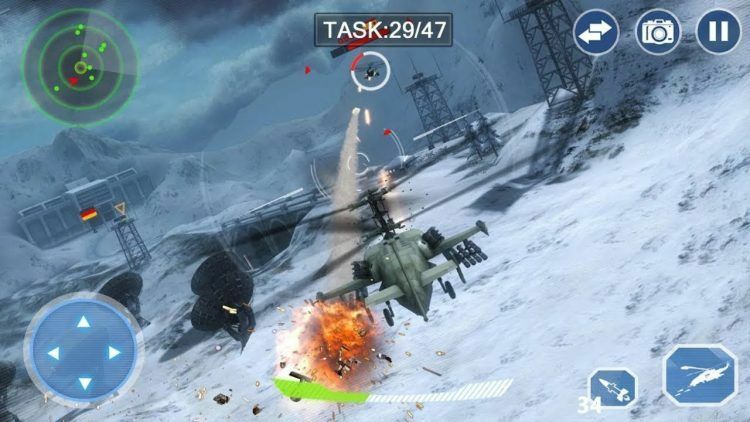 Air Force Lords: Free Mobile Gunship Battle Game is a flying third-person shooter developed by Superfun Studio. It follows the basic pattern that flying simulation shooting games have been adopting over the years. You will fly a warfare aircraft that shoots directly ahead to destroy all enemies on the screen and clear the level. The goals keep changing. Your mission may be to destroy enemy watchtowers, tanks, warships or even other fighter planes. Some special ops involve discovering special areas and gathering data as you fly over. Whether on the ground or in the air, enemies will shoot back at you. Therefore, be prepared for total chaos. Play Air Force Lords on PC or Android to destroy the enemies that have come to attack and plunder your homeland. At its core, Air Force Lords is a reaction-based game. You need fast reflexes to dodge enemy bullets, missiles, and the constant swarm of projectiles coming your way. Double accuracy and swiftness are critical as you fly over the area wiping out enemies as they emerge. Luckily, fighter planes aim at enemy targets automatically. All you have to do is navigate your chopper and fire at will. You can change the visual angle by tilting your phone. It is also possible to replicate all the simple mobile controls even as you play Air Force Lords on PC. There are over 50 levels to clear in Air Force Lords. Taking part in either Battle or Boss mode will cost you stamina units. Stamina regenerates with time. For each completed level, you win a star rating, coins, diamonds, and other rewards. The game offers 10 war helicopters to choose from, all of which are unique in their own way. Make your plane stronger by upgrading its HP, speed, agility & auto aim. You can even equip it with machine guns or explosive missiles. Upgrades for your weapon of choice will increase aspects such as the magazine size, range and DPS (damage per second). The levels become harder as you play on. Therefore, you have to spend coins and diamonds to upgrade your war chopper and equip it with better weapons. Watching a video ad is the best way to collect more rewards for free. You might get an offer to watch an ad and get free diamonds or multiply your coin reward up to five times. Make sure your Internet connection is on to take advantage of such offers. Air Force Lords rewards you for completing daily tasks, signing in or achieving certain milestones. You will get a free prize for the first 30-days you log into the game. The lottery also offers an opportunity to win a random prop. Always click the ‘Reward’ tab to see what prizes are available for claiming. The radar on the top left corner of your screen makes it very easy to locate enemies. Navigate toward the red triangles or dots on the radar to locate hostiles faster. Explosive bombs will deal more damage than bullets from a machine gun. Therefore, they are the best weapons to use if you are looking to kill big bosses quickly. In addition to the total gold reward for each level, you get extra coins for every enemy you blow up. Therefore, spare nothing in your path even if it is not part of the mission’s objectives.